These printable worksheets can be used to teach students about the parts of a computer, including the mouse, CPU, keyboard, printer, and router. Match each computer part with its description. Cut the word boxes and glue them on the diagram. This black-and-white picture shows the major components of a home computer. This full-color illustration shows and describes the major parts of a personal computer. On this worksheet, students label the major parts of a computer, including the modem/router, monitor, mouse, keyboard, CPU, and printer. 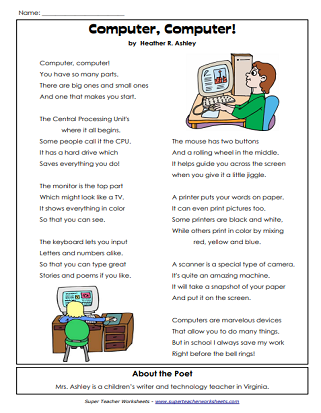 This fun poem teaches kids about the different parts of a computer. Our teacher helpers page features printable award certificated,lesson planners, calendars for kids, gradebooks, and much more! We have printable worksheets for almost every math topic covered in elementary school.